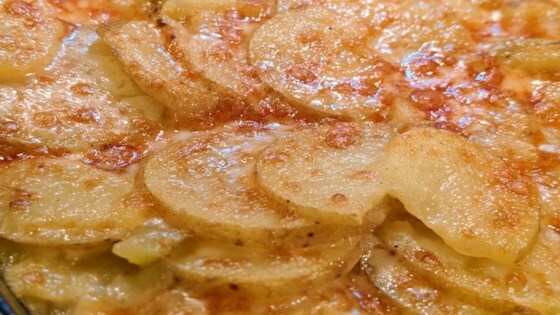 "Scalloped potatoes are the ultimate side dish. Try this quick and easy version made in minutes in your Instant Pot®!" Set an oven rack about 6 inches from the heat source and preheat the oven's broiler. Combine potatoes, vegetable broth, and salt in a multi-functional pressure cooker (such as Instant Pot(R)). Close and lock the lid. Select high pressure according to manufacturer's instructions; set timer for 1 minute. Allow 10 to 15 minutes for pressure to build. Transfer potatoes carefully to an 8-inch square oven-safe deep dish. Combine 1 1/2 cups Cheddar cheese, cream, garlic powder, pepper, and nutmeg in the pressure cooker with the remaining liquid; select Saute function and cook until smooth and creamy, about 5 minutes. Pour sauce evenly over potatoes and sprinkle with remaining 1/2 cup Cheddar cheese. Broil in the preheated oven until golden, about 5 minutes. Followed the recipe exactly. Easy and so delicious! Will be making again and again and again! A few of my potato slices were too thick and not fully cooked. Otherwise, it was awesome! I really enjoyed the flavor of this recipe. However, the potatoes were a bit underdone. I used my mandolin to slice the potatoes to 1/4" thickness. Next time I will try 2 minutes. Not what I had in mind for scalloped potatoes. More au gratin. Way too much cheese for me and the use of an insta-pot was unnecessary. Excellent, made larger portion than recipe called for and had to adjust cooking time, but was a big hit with family.